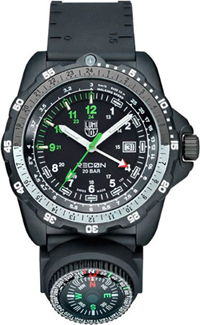 Luminox Recon is the model. In January 2013 Luminox watch brand has expanded collection NAV SPC new model Recon. In January 2013 Luminox watch brand has expanded collection NAV SPC new model Recon. It is designed specifically for those looking for adventure, try to reach new heights. Note that the model was developed with the participation of military specialists and consulting engineers is a former Swiss Army Sergeant Andrea Michelli. New watches are equipped with massive case of polycarbonate, with a diameter of 46 mm. Equipped with body tachymeter scale. On the black dial marked with luminescent hour-markers, which do not require charging in the sun. Indication of hours, minutes and seconds by using three central hands. Another central arrow indicates the number of the second time zone. Original design of the strap is also a mini-compass. Its perimeter marked scales allow to make measurements on the map. New Recon from Luminox is equipped with a quartz movement Ronda.